Yes, readers, Oktoberfest. So you know this entry’s going to be….amusing. And not just any Oktoberfest. No, no, this fête de la biere was the 200th anniversary – and as far as I can tell, the Germans know how to throw a birthday party. I departed Aix with no real ideas of what to expect. Apart from Mardi Gras which utilized much more neon and spandex, I had never attended a European festival of binge drinking and lederhosen. And so other than the knowledge that pretzels come from Germany and the big beers are called steins (and 1 = about 5 regular beers), I set off on my Lufthansa flight to Munich with Audrey to my left and two free glasses of sparkling wine in each hand. Disclaimer: I did not ask for two glasses, our American excitement of the idea that drinks – let alone alcohol – was gratuit on a plane must’ve been obvious enough to warrant the, “you wanted another, right?” And who am I to say no to some good ol’ German hospitality? We arrived in Munich to find our French cell phones worked only in France – go figure. But somehow managed to locate Sarah and, of course, have our first Oktoberfest beer in the Munich airport while we waited for Dana’s flight to arrive. Once all united, we set off for the Hostival. Yes, the name alone should’ve been a tip off. 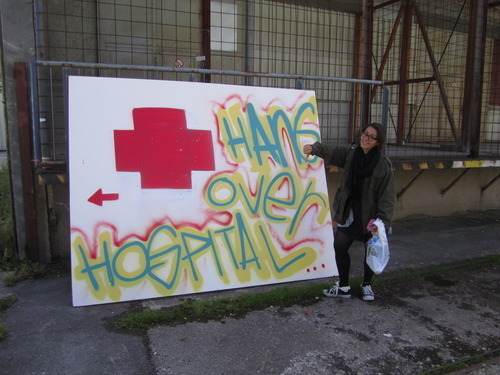 A youth hostel, at Oktoberfest, themed as a hospital and lovingly termed the Hangover Hospital. “Guys, we are all showering together” was my first reaction. One that, I thought, was completely warranted and logical – strength in numbers and all that. But considering those were the first words I spoke since basically departing the airport, my friends collectively decided that all these years of boys (and boy problems) were simply my way of saying, “Guys, I’m gay.” Go figure. And so us 5 weary travelers put the bed covers on our mattresses and hid our valises under our thin, scraggily excuses for blankets and did what any college students would do in this situation: went out for a drink. The HB tent: my personal favorite and also the last place that we all saw our sobriety and dignity. If found, feel free to return. But it was not until Saturday at a whopping 7:30am that the real festivities began. Clad in our jackets and high hopes, the 5 Tulanians set out for the Fest that we, being students of New Orleans, felt we had been made and trained for. We would soon learn that we were sadly mistaken. If this is starting to sound like an R.L. Stine “Goosebumps,” it’s right about now that I’m wishing I could choose another ending. But to continue, tents open at 9 and beer starts flowing at 10 – it was nice to see that there was some maintenance of classy drinking habits. Along with the beers, cheesy bread and pretzels were plentiful in the tents, as were men and women clad in Lederhosen and Drindles, both classic and modern. 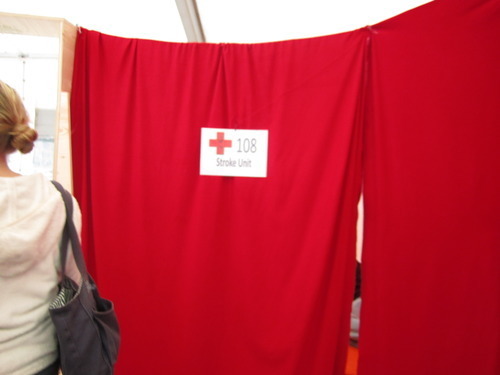 The ceilings were adorned with colors and tent name emblems lined the walls. But above all: there were people, there were songs and there was beer. After meeting up with this crew and getting kicked out at 11am (that’s when the VIP reserved people got to go in) we managed to find, guess what, MORE TULANIANS along with lots of Germans, Italians and some very chatty Parisians! 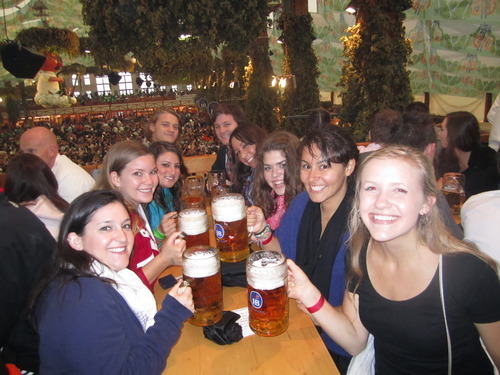 Yes, it was a Tulane filled weekend in Munich. Most of you can probably recognize this sentiment, of walking into a bar – whether it be the Boot, Bruno’s, Rocco’s, F&M’s, you name it – and realizing with one look-around that you know 9.5 out of every 10 people in that bar. 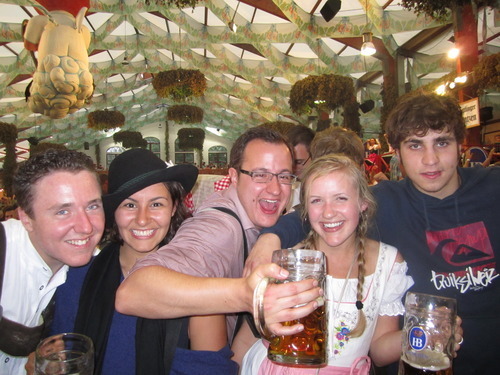 My statistics were so great at Oktoberfest, but there was one moment, while standing with my new German friend Linus on a table at Hofbrau tent, that I looked around and had that feeling that I was surrounded by people who I knew. And it was true! To my right was Linus (sans blanket but nonetheless awesome), to my left Dana and Christina, across the table: Audrey and (if memory serves) Sam Glidden and Scotty Jospin made an appearance, all while Trent and I prost-ed across the table and swayed to the sounds of the music that threatened to get so loud that the entire tent could burst with joy and musical notes at any moment! It’s a strange feeling, the sentiment of feeling home simply by being around people who have a love for the same place as you do. 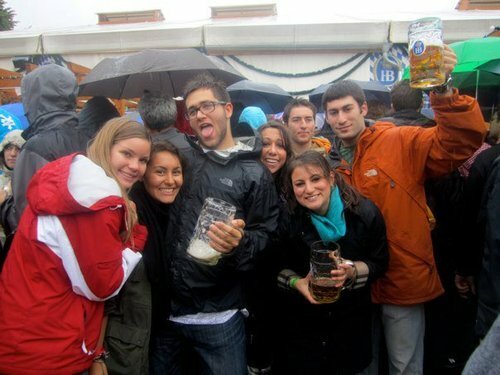 But this had to be my favorite moment of Oktoberfest. Sure, there were other memories – stories of what you did the night before count as memories right? – And plenty of one-liners that defined the weekend, but as I sat on the plane coming home I couldn’t help but think of how that feeling of home manages to sneak up on you at the strangest of times in the strangest of places. That, and how bad I felt for the man sitting next to me who could clearly tell that just the sight of his free-on-Lufthansa beer made me want to throw up. All in all, this weekend was one of the most amazing, trying, intense, fun, beer-filled weekends of my life – and for anyone who’s been to Mardi Gras, you know that’s saying something. Also for anyone who has seen me during one of my “This-is-by-far-my-worst-hangover-ever” mornings, of which there have been a few (ah-hem Halloween, November Rain), I am serious when I say that this one was by far the worst. Enough so that it is officially Sober Oktober for me. Mom and Dad, I can hear your cheers from across the pond. When I returned to Aix late Monday night after, probably the longest day of my life, my only answer to the question of “how was it! ?” was: “I am so glad I went and it was amazing, but I never want to do that again.” This was followed by many stories, including the death of my Blackberry (I’m still in mourning) and Dana’s decision to become a Woman’s Rights major in Germany while living only off of chicken and pretzels. Stories of crazy Italians, random twin brothers, something about a mayonnaise fight and how I, apparently, am casting the fifth Twilight. (Men on the street in Munich, I’m sorry but the growling just didn’t cut it. Maybe next time.) Needless to say, the final scoreboard read: Ali – 0, Oktoberfest – 100,000 and I’m still here marveling over the fact that I can make it through 2 Mardi Gras with no phone issues but one night of rain in Munich can drive my Blackberry to suicide. 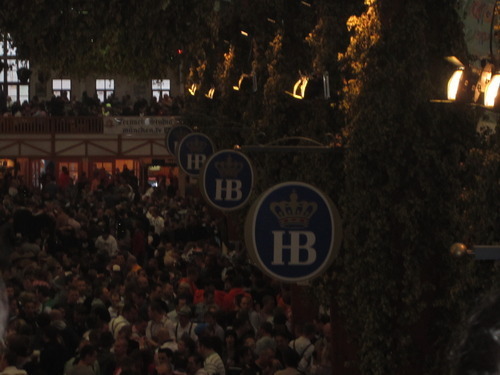 Correction: Oktoberfest – 100,001. 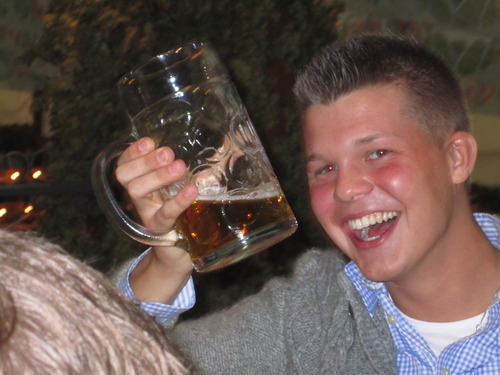 Well, until next time, Prost!